Daniel Dennett is a remarkable American author and philosopher, who is credited for making significant innovative contribution to the philosophy of science, mind and biology. Daniel was born on March 28, 1942, to parents Daniel Clement Dennett Jr. and Ruth Marjorie in Boston, Massachusetts. His early years were spent in Lebanon, where his father worked as a secret counter intelligence agent with the Office of Strategic Services. His father passed away when he was 5 years old, and Daniel returned to Boston along with his mother. He became attracted to the subject matter of philosophy at the tender age of 11, during a summer camp, and ever since, he was determined to carve out a career for himself in philosophy. Daniel attended the Phillips Exeter Academy for a while, and later, enrolled himself at the Wesleyan University for a year. He received his degree in Bachelors of Arts in philosophy from the Harvard University in 1963. Upon his graduation, Daniel was admitted to the University of Oxford, where he benefited from the tutelage of Gilbert Ryle. He was also made a member of Hertford College. In 1965, Dennett received his Ph.D. in Philosophy. Dennett began his professional career in 1965, by accepting a teaching position at UC Irvine, he served here for the next six years. In 1971, he was offered a professorship at the University of Tufts, which he continues to serve till date. In addition to that, he is also the co-director of the Centre of Cognitive Studies, along with the Austin B. Fletcher Professor of Philosophy. Along with his teaching profession, Daniel is credited for making several notable literary contributions which have played a significant role in the evolution of modern philosophy. He published his first book in 1978, entitled “Brainstorms: Philosophical Essays on Mind and Psychology”, the book provides an insight on his theories of artificial intelligence and consciousness. In 1981, he published another remarkable and widely applauded work, entitled ‘The Mind’s I: Fantasies and Reflection on Self and Soul’. He followed that up with a book that dealt with free will and determinism, entitled ‘Elbow Room: The Varieties of Free Will Worth Wanting’. Dennett introduced the term of ‘Intentional stance’ which he describes as the level of abstraction and mental properties we see while examining the behavior of our objects of observation. He proposed that there are three levels of abstraction: The physical stance, the design stance and the intentional stance. During the 1990’s, Dennett became increasingly fascinated by the contrasting brain of humans and animals, and he sought to make comparisons. He also became occupied by conducting an analysis on the concept of free will, and its relationship with naturalistic perspective of the world. In 1991, he composed another innovative work entitled ‘Consciousness Explained’, where he provided a comprehensive analysis on the physical and cognitive makeup of the human brain, and how the physical and cognitive process work to arouse the consciousness. The book also shed light on the multiple drafts model of consciousness. In 1995, Daniel Dennett presented the world with his greatest single work, entitled “Darwin’s Dangerous Idea”, which proposes natural selection as a mechanical and algorithmic process based on the Darwinism theory of evolution. The book was globally applauded and widely discussed, it was nominated for the 1995 National Book Award in non-fiction, and it rose up to become a finalist. It was also awarded the 1996 Pulitzer Prize for general non-fiction. 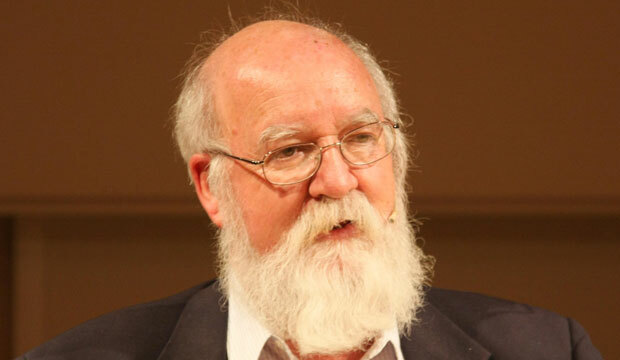 In 2003, Dennett published yet another monumental work, titled “Freedom Evolves”, which deals with the concept of free will and moral responsibilities in relation with consciousness and personhood. Several other phenomenal contributions by Dennett include ‘Breaking the Spell: Religion as a Natural Phenomenon’, ‘Sweet Dreams: Philosophical Obstacles to a Science of Consciousness’, ‘Neuroscience and Philosophy: Brain, Mind, and Language’, Science and Religion’, ‘Intuition Pumps and Other Tools for Thinking’ and ‘Inside Jokes: Using Humor to Reverse-Engineer the Mind’. Daniel Dennett has been presented with several awards and honors as a tribute to his groundbreaking research and academic contributions. He has been awarded a Fulbright Fellowship, a Fellowship at the Centre for Advanced Studies in Behavioral Science, two Guggenheim Fellowships and a Fellowship of the Committee for Skeptical Inquiry. In 2004, the American Humanist Association presented him with the title of the Humanist of the Year. In addition to that, he is also a proud recipient of a Human Laureate of the International Academy of Humanism. In 2010, Dennett’s name was listed in the Honorary Board of distinguished achievers by the Freedom from Religion Foundation. He awarded the Erasmus Prize for his tireless efforts in translating the cultural significance of science and technology to the masses. Daniel Dennett is an ardent atheist and secularist, he is famously known as one of the Four Horsemen of New Atheism. He also serves the Secular Coalition on the American advisory board.